One of the first things that I wanted to accomplish with the A Song of Ice and Fire miniature wargame was to treat the game like a historical wargame, with the books by George R.R. Martin as the reference. I didn’t want to rely on either the TV show or the game’s art for my colour schemes. This would be difficult as certain decisions of arms and armour were made for me by the game’s designers and sculptors. Still, I wanted to keep as close to the book as possible in regards to uniforms. It turns out I’d have an easier time baking Lamprey Pie; George R.R. Martin spends far more time describing food than he does describing outfits. This is fine as a writer but frustrating for someone trying to envision how the armies in his books would have dressed. The red cloaks wore mail shirts over boiled leather and steel caps with lion crests. This is pretty much the entire description of Lannister guards throughout the first book. There may be more elsewhere but with all my other projects completed I didn’t want to wait any longer for research. 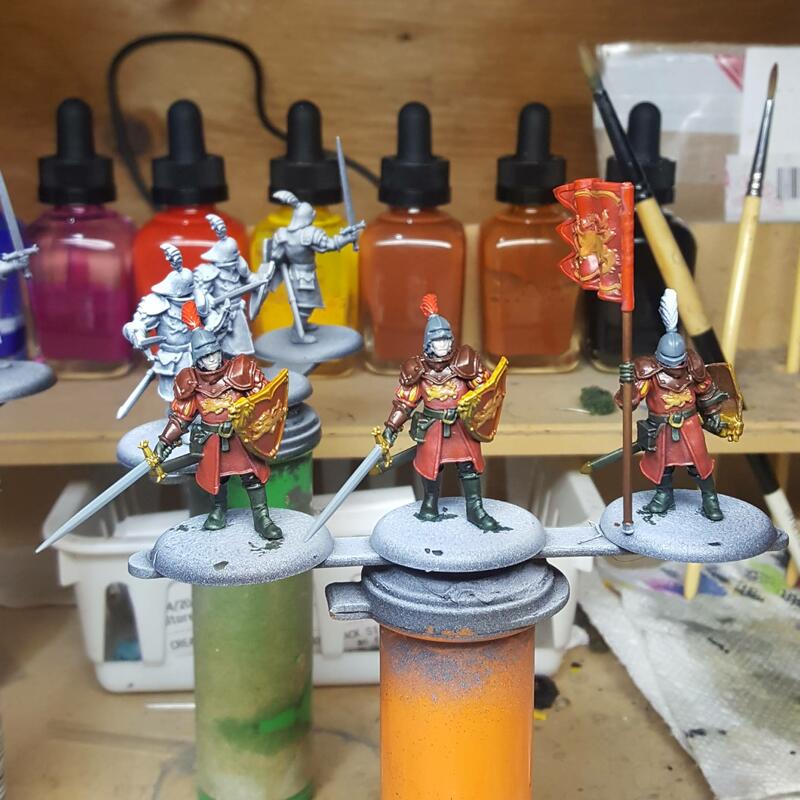 Initial paint scheme test of Lannister Guards for A Song of Ice and Fire miniature game. The colour scheme for the Lannister army will then be red trimmed with gold. Since there is no mention of plate the pauldrons and gorgets will be interpreted as boiled leather. This is more likely than plate as it is both lighter and cheaper. The Lannisters may be rich but I don’t think they’d waste money on their common infantry. Being leather the armour could then be dyed red to make the colour scheme. Although I originally planned that the troops would have gold thread embroidery I felt that even the Lannisters would not spend so much on troops. Yellow-dyed cloth and paint would work well enough. This also leaves me room to make my commanders and uniques stand out by painting their embroidery as golden thread. Since there are so few descriptions of Lannister soldiers in the books I’m leaving myself free to come up with some of my own interpretations – for example the standard bearer wears a white feather instead of red to signify the honour in bearing the standard. Similarly the Guard Captain unit attachment will have a gilded helmet. The Captain is likely a minor bannerman who has brought this unit to answer the Lannister call. I think the finished unit came out well. I like how the red paaldrons look different from the red cloth and the steel helmets draw your eye to the heads. It took just over two weeks to paint. I am hoping to find some efficiencies to speed this up. 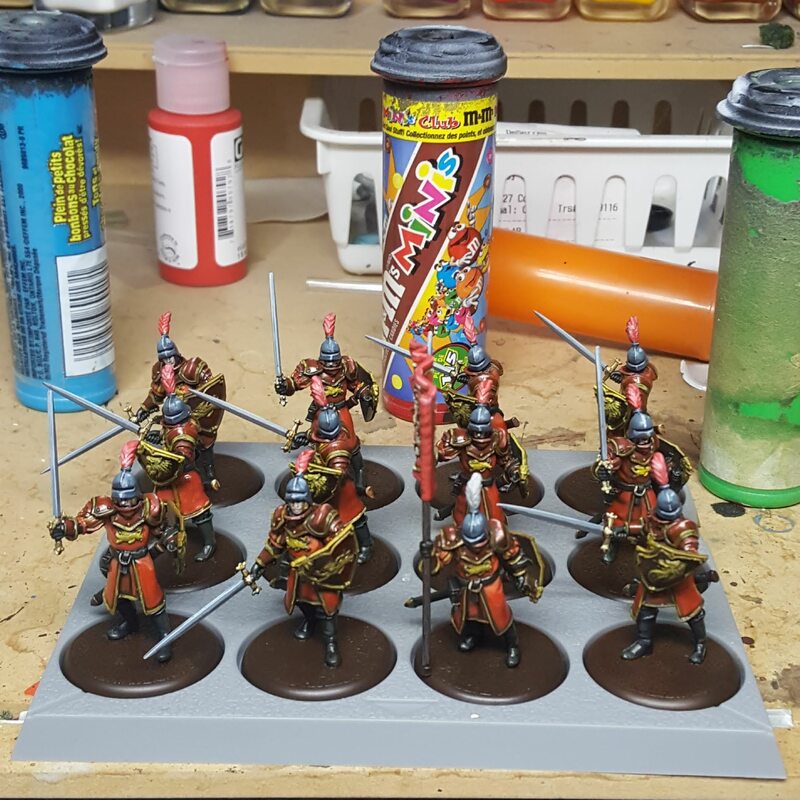 One more unit of guards to go. Quite nice! The red and yellow are a bit vibrant for the sort of pseudo-early renaissance look that the books invoke, but fit better with the sort of fantasy world that the game and sculpts imply. Are you going to flock and tuft the bases, or are you going to keep them plain? I will be flocking the bases. Not sure about tufting. I want to experiment with making my own which has prevented me from buying any. I probably will tuft. Weld and Persian Berry can make bright yellows as well. Mordants of alum were used since the roman times. I do not know, to my eyes those are all duller, but then I have color deficient vision! I think that the Lannisters (proper) should be very colorful to set off against all the dull colors of the Starks and poorer houses, but again I think colors generally should be duller as they would fade. Looks great! I particularly like the distinctions between the shades of red. I’m looking forward to seeing what you do with the Starks. Thanks, I’m really looking forward to starting them. Just need to finish the Mountain’s Men and then all the Lannister characters. I’ve started to stream as well, check out http://www.twitch.tv/coyotebd if you want to follow along. Most nights at 10pm EST.